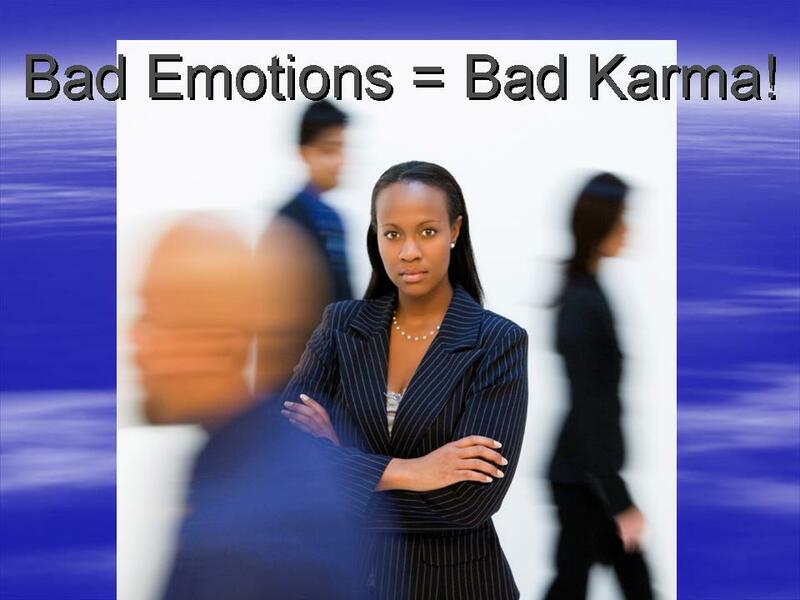 Bad Emotions = Bad Karma! Many of us become too emotionally involved in the negativity of our emotions. The yelling, drama, the selfishness, the jealousy, insecurity, emotional upheaval, anger, and the fear factor, are all negative emotions, and bad energy we allow to enter our relationship and mutate into a strand of relational destruction. Karma, as we know, is the law of moral causation. We’ve heard the whole “architect of our fate” theory. It is all relative to the “reap what you sow” universal law that many believe in. What we execute on others, we in turn execute on ourselves. This is the Law of Cause and Effect. Bad emotions have the same energy as bad Karma. Each time we go through a relationship that has been destroyed, the end is so devastating that it leaves us with some emotional damage we need to care for and heal. But many of us lay it at the foot of our next victim (partner). In doing so, we are only recycling the ways that cause relational destruction. Some of us wonder why we attract the same crazy people and we experience the same results. Some of us are attracting the same type of relationship we want to avoid. If you are aware of “The Secret” then you know about the “Laws of Attraction”. The rules are, what you emotionally and mentally engage in is what you attract in energy. So, if you are negative, you attract everything that is negative. Our emotions are such strong feelings, it is impossible not to ignite the Laws of Attraction. If you are engaging in relationships that are toxic, you will continue that attraction until you make a shift or change your energy, which is in part, a combination of your thoughts, feelings, interactions, and behaviors. We may experience in one relationship where we were the victim. When that relationship is over, even though it took us too long to end it, we carry the residue of negativity with emotions and energy into the next relationship, making the new person in our lives the victim, or we become a victim again. Unfortunately, the cycle continues again and again, from partner to partner. Bad emotions create bad Karma, and they all pretty much work the same way. Recycled bad emotions are usually encased in ultra sensitivity, which results in frustration and anger in the relationship. This impacts both partners— the one who is dishing it out and the one who is receiving it. This type of handiwork reduces the relationship to minimal emotional value. These feelings are not only hindrances to a loving relationship, but they bring a vicious cycle of the same again and again— in the same relationship! With all of this going on, there is not much room left, except to observe the slow corrosion of something that was once very special, forcing the receiving partner to make a decision. It takes a lot for us to come to the only decision that has nothing to do with staying, and that decision is to leave. Whatever the decision, in the end, and when the relationship is over, both partners will need to cleanse their energy to ensure the bad energy that was once in their lives, will not lay dormant until they enter another. If not, the cycle of bad emotions, will continue to generate the same Karma as before. Which is why it is imperative we cleanse from the previous relationship. We are generally creatures of habit, and we take those with us from one relationship to the next. This is one of the problems in why we get the same results. We are habitually bringing in the same negative emotional behaviors. Additionally, we are emotionally wounded and scarred with the residue from the partner we have just left. Cleansing is mandatory. There are many ways to cleanse bad Karma, and one of them is the same answer you will find again and again in any research you discover. You must change! Bad emotions, create bad Karma. This entry was posted in Live and tagged bad emotions carry bad karma, karma in relationships, laws of attractions in relationship. Bookmark the permalink.